Our Tour Train Packages featuring "AMTRAK"
KEY HOLIDAYS offers dozens of rail tour packages featuring Amtrak. These packages are on regularly scheduled Amtrak routes. Please visit www.KeyHolidays.com for more information. KEY TOURS INTERNATIONAL, a sister brand to KEY HOLIDAYS, will be launching exciting train tour packages with some of the most thrilling train tours in the world. KEY HOLIDAYS, under contract with Amtrak and the local joint powers authority, operates its own branded "FUN TRAINS". Back in1963 the Southern Pacific Railroad and the Reno Chamber of Commerce devised a plan to stimulate wintertime tourism and the Reno Fun Train was up and running. Over the years various tour operators ran this train creating a reputation for the train as a huge party on wheels traveling through the spectacular Sierra Nevada Mountains destined for Reno Nevada, "The Biggest Little City in the World". In 1993 Amtrak awarded the contract to KEY HOLIDAYS of Walnut Creek, CA who not only reestablished the traditions of the original Reno Fun Train, such as the live Dance Band, Strolling Minstrels and party atmosphere, but also added new features; light meals served roundtrip, Souvenir Shop, Piano Lounge Car, Dance Car and Sightseeing Dome Car. In 2017 under previous ownership the Fun Train season was cancelled. Now owned by Train Travel, Inc. the Reno Fun Train is scheduled to resume operations in 2019, along with a full year of "Fun Trains" to other destinations. In addition, the "Fun Trains" under Train Travel, Inc.’s ownership will feature more accommodating passenger railcars and new onboard train programming for the entertainment of our guests. Join our e-newsletter to keep informed! 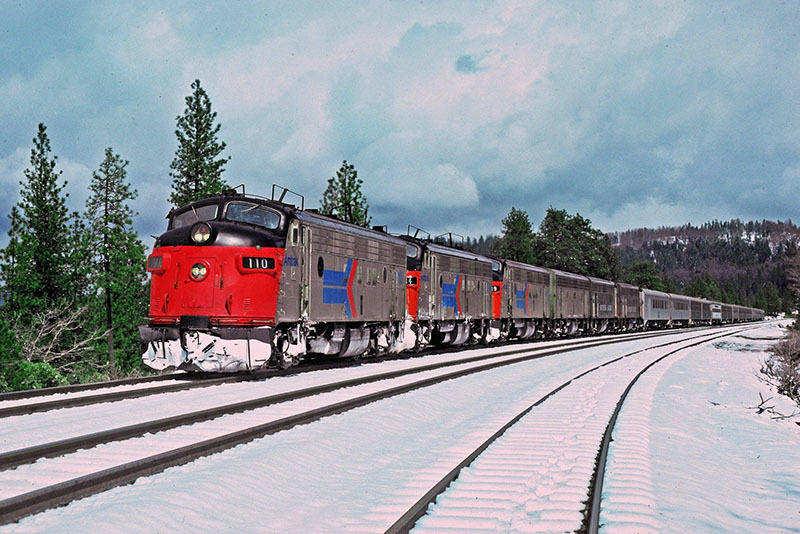 Over the years as the weekend Reno Fun Train became a huge success and the recognition that some travelers would prefer train programming to guests desiring "less party" or an atmosphere more accommodating to seniors, family and children, in 1996 KEY HOLIDAYS began running a midweek train originally named the "Reno Snow Train", but later renamed the "Sierra Scenic Train". This train was a daylight train in both directions and allowed our young guests under the age of 21. The Sierra Scenis Train featured single level Amtrak equipment, Souvenir Shop, Strolling Minstrels, Piano Lounge Car, and Sightseeing Great Dome. The Dance Car with DJ Music was available on some departures. Train Travel, Inc. and KEY HOLIDAYS plans to re-launch this train in 2020 using a dedicated set of high end passenger equipment designed for an amazing rail experience through the Sierra Nevada Mountains and accommodating for seniors, families and children. To our knowledge, no other rail operator, other than Amtrak (since 1971), has operated trains to Las Vegas from California, with the exception of KEY HOLIDAYS. In 2002 KEY HOLIDAYS ran its Vegas Fun Train from Los Angeles California to Las Vegas Nevada. We believe that this train will have great public appeal and will be re-launched later in 2019. Train Travel, Inc. became the first rail tour operator in North America to operate a modern dinner train. On Saturday evening, August 4, 1984, history was set as the first modern day dinner train departed Osage Iowa as the Star Clipper Dinner Train ®. This train set the standard as North America's first dinner train as over twenty-five other dinner trains would follow over the years in various parts of the United States and Canada, with practically all of them offering only catered meals. Our train experience features three components: (a.) a five or six course meal prepared fresh onboard the train; (b.) a three to four-hour train ride onboard a classic moving train; and (c.) live tableside entertainment featuring either a musical show or a theatrical performance. Today while other dinner trains exist, the Star Clipper Dinner Train ® has never been matched with its fresh, chef-prepared onboard meals and excellent live tableside entertainment. Our trains have been featured in many movies and documentaries. The Star Clipper Dinner Train® has provided memorable rail-oriented entertainment experiences to well over three million passengers over thirty (33) years. The Star Clipper Dinner Train® set the standard for Murder Mystery theatrical shows and musical shows performed "Vegas-Style" onboard a moving train. Our Murder Mystery Show, "MURDER MADNESS", became Michigan's longest running murder mystery show period. No other dinner train in North America has ever completely matched the Star Clipper's unique dining and entertainment experience. Today Train Travel, Inc. is searching for the next home for the Star Clipper Dinner Train® so it can continue to offer a themed rail entertainment experience to people of all ages. Our Children's and Family Trains have the same three basic components as our premium dinner train - food, a train ride and a themed performance. Other Company-owned and branded entertainment includes the "QUEST FOR THE GOLDEN SPIKE" and later in 2019 will be announcing its own competition to the "Thomas The Tank" story and show. Train Travel’s new character is more in touch with U.S railroad history and modern-day trains and its story lines, the Company feels, are more relevant as well.